Discussion in 'Shocks, Suspensions, Lift Kits' started by crazyfoolreal, December 8, 2004. I am going to use some f 150 spacers for the front coils to get about 2 inches and I am wondering how much and where i could find some warrior shackles for the back leaf springs. EBI, not to call you a liar but every time I've looked (or called) for pricing, it's more like $65 + shipping. Are you really finding those prices? I got my WAR 353s for $59 shipped. $49.00 plus shipping. I got mine through rubicon4x4.com. Everyone else claims they got theirs really cheap from 4wheelparts. Mine have the gold zinc coating. These are the ones I got, the price and shipping have gone up though. I know I got them to my door for -$60. The 153's are also priced at $57 now I noticed. I got them about 6 months ago. Edit: Sorry my quote was a little low on the estimate. If not the warriors are still a good buy. LOL, those look good You race that thing down in the salt flats??? Ya, thats life in Ontario, they just love to put tons of salt on the roads, dosent take long for things to rust, and I drive alot of dirt roads. I just installed A set of Warrior 153 shackles on my Sport. Not real happy! I got about one inch lift but I lost most of the arch in the mono spring and the ride is much stiffer. I'm worried what the springs are going to do when I put some weight on the back by pulling a trailer! I wonder if I'm damaging the spring by leaving it this way? Any ideas? Yep, 4-door leaf packs should have been your first upgrade before longer shackles. In fact, when you asked about shackles with mono-leafs here about 11 days ago, ExplorerSportNu suggested to you to go with 4-door leaf packs. IMO, you do not want to run longer shackles with just a mono-leaf, you will only be contributing to sagging them even quicker. Thanks guys! What year models of 4 door leafs will fit my 2000 Sport? How will the steel leafs affect the ride and how do you know if the springs you get from a salvage yard are any good? Are there that many wrecked 4D X's out there? I just bought this truck and like it a lot, but I just heard about the cam chain tensioner problem. If there are a lot of them in the salvage yards now I know why! 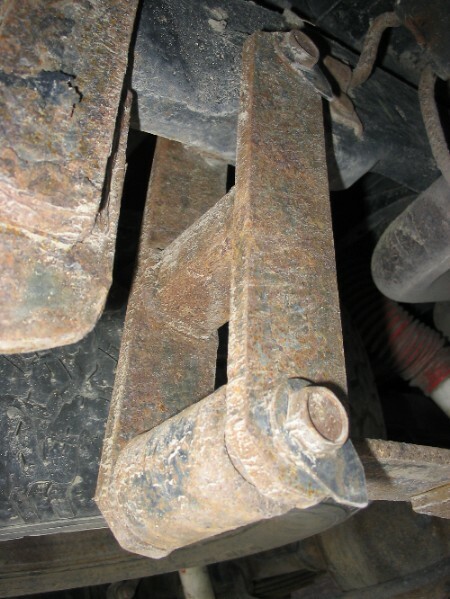 Your explorer can use any leaf springs from 91-01? Can you find the dimensions to those shackles, or let me know where you found them. I would rather build them myself. Thanks.